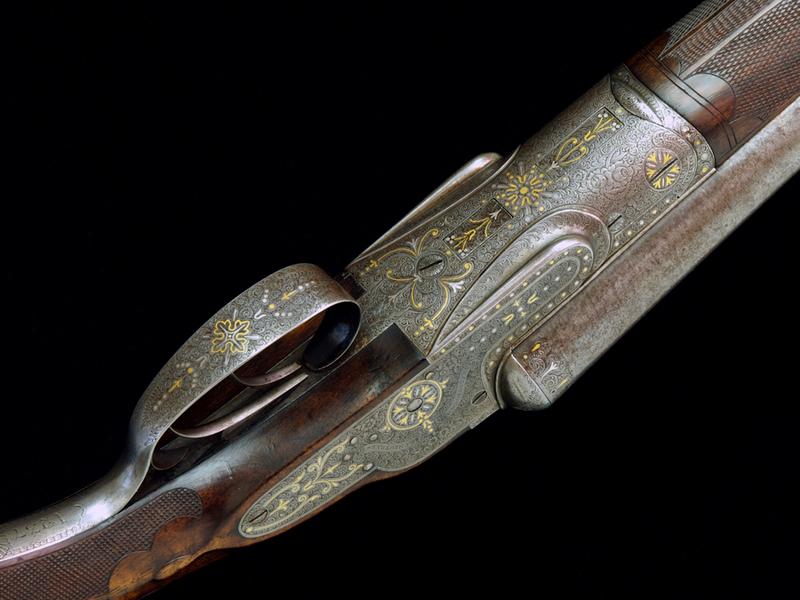 An early example of the company’s high-grade guns, this thoroughly embellished 12-gauge, Serial No. 126, features back-action locks of the maker’s patent and a cloverleaf-shape doll’s-head slotted for a third fastener. This article originally appeared in the March/April 2015 Shooting Sportsman. It may be hard to believe, but San Francisco once was a mecca for the shooting sports. Little more than a buggy ride away was exceptional waterfowling in the Sacramento Delta as well as Tule elk and grizzly bear hunting in the coastal range. Then in 1848, with the discovery of gold near Sacramento, San Francisco’s population exploded as miners, would-be miners and merchants (of all sorts of wares) flooded into central California. Both the Panama Canal and the Transcontinental Railroad were still decades away, so incomers were forced to choose between a long journey by ship or a trek across the California Trail. John Plumb Clabrough chose the latter. 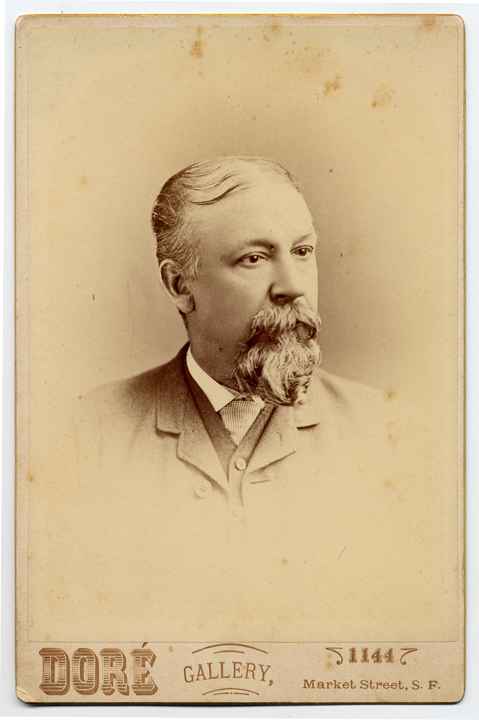 A commercial photographer’s portrait of J.P. Clabrough taken in San Francisco. What J.P. did for Hawken and how long he worked for him have been lost to time. Clabrough family lore suggests that when J.P. finally decided to strike out for California, he made the 2,000-mile, five-month journey with two companions. Normally such a trip began with a boat ride westward on the Missouri River to Independence, Missouri, where a traveler bought supplies and joined a wagon train. By late 1863 J.P. Clabrough was listed in San Francisco’s business directory. He may have spent time in California’s gold country too, as records show he owned shares in a Tuolumne County mine. The shares may not have paid off, however, as in San Francisco he went to work as a gunsmith with Wilson & Evans, a shop that had moved from Sacramento in 1862. That was the year a national income tax was imposed, to help fund the Union effort in the Civil War. Clabrough earned enough to pay $27 in income tax in 1863. The following year he went to work for San Francisco’s most prominent gunmaker, Robert Liddle & Company, and by 1867 he had his own shop, at 630 Montgomery Street. At least three of Clabrough’s earliest guns—two side-by-side 12-gauge percussion shotguns and a .52-caliber percussion rifle—have survived. Marked “J.P. Clabrough San Francisco,” they are of low to medium grade. Only one has a serial number: 1004. A 12-gauge percussion gun with locks stamped “J.P. Clabrough, San Francisco,” believed to have been built in 1867. In 1868 a large and growing market existed for rifles and shotguns in the western US, and J.P. was well situated to take advantage of it. What happened next is a mixture of fact and informed guessing, but we know that J.P.’s brother George moved to San Francisco from Illinois to join his brother’s rapidly expanding business. At about the same time, J.P.’s younger brother Joseph, still in England, relocated to Birmingham to establish himself as a gunmaker. In April 1868 J.P. traveled to England, returning stateside in late July. It appears his visit was to arrange to have guns made in Birmingham to his specifications and marked “J.P. Clabrough & Bro. San Francisco.” Joseph, who also had been trained as a gunsmith by his father, joined the business to oversee the logistics and to ship the guns to San Francisco. When encountered today, the guns usually have serial numbers from the companies of origin, of which W.W. Greener most likely was one. Clabrough’s San Francisco operation flourished, but a grander scheme was on the horizon. In 1871 J.P. returned to Birmingham, where he rented a large shop at 8 Whittall Street (gunmaker Ebenezer Hollis’s premises until his death, in 1869) and set up a factory. He also made a deal to sell Greener’s guns through his shop in the US. Just how long that relationship with Greener lasted is unknown. This was an expensive undertaking. How in such a short time had Clabrough been able to develop such a strong financial position? Perhaps those mining shares had paid off after all. When brother George became a partner, the firm became known as J.P. Clabrough & Bros., with both San Francisco and Birmingham addresses. The Clabroughs built and sold guns for the next 20 years. Most were shotguns, but there were also a few Cape guns (side-by-sides with both rifled and smoothbore barrels) and single-shot and double rifles. Much Clabrough production was “trade” guns—the low-priced variety sold in mail-order catalogs or hardware stores. From surviving period advertisements, we know that the low-quality guns often bore names such as “Samuel Buckley,” “G. Hemenway,” “Never Miss,” “The Invincible” and “W. Richards.” Clabrough apparently did not have specific models; instead he offered a sort of bulk-bespoke system that let wholesalers order guns made to their tastes and budgets. Clabrough-marked guns were of a better quality than the trade guns. Unfortunately, no Clabrough price lists from the 1870s have surfaced. 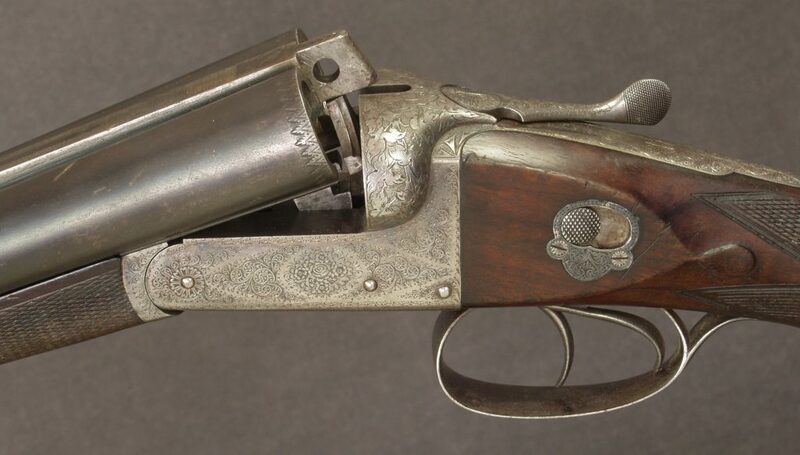 As with shotguns and rifles, better revolvers were marked with the Clabrough name; those of lesser quality were stamped “Frontier Bull Dog,” “Western Lion” or other colorful names. Clabrough eventually sold a lot of revolvers, most of them made in Belgium and proofed in Birmingham. J.P. Clabrough was very fond of life in California, but the rapid growth of his business forced him to move to Birmingham in 1873. Concurrently, in Minnesota events were developing that would have a significant impact on him. William Golcher was a noted longtime gunmaker in St. Paul. Around 1873, when his health began to fail, Golcher decided to give up his gun store and factory. During a visit to England in 1877, he met J.P., who offered him a job managing Clabrough’s San Francisco operation. Golcher accepted and relocated to California in 1878. In 1880 he bought a half-interest in the San Francisco store. Clabrough & Golcher later became Clabrough, Golcher & Co. and operated in San Francisco well into the 20th Century—although with J.P. having died in 1895, the Clabrough name was dropped after the 1906 earthquake destroyed the company’s building. 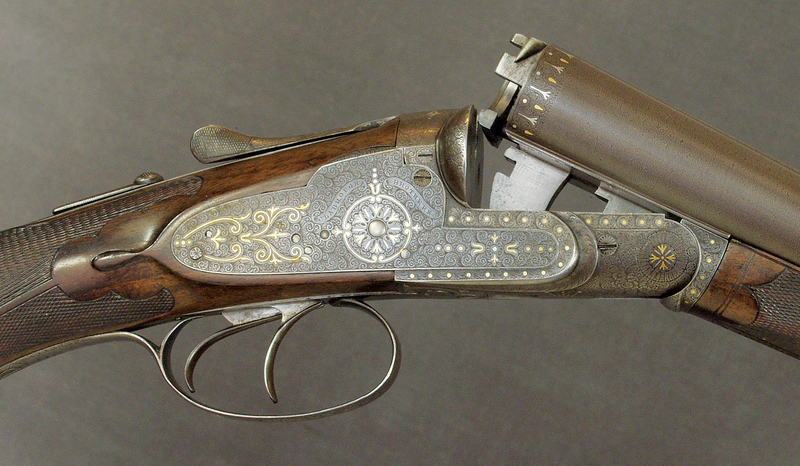 With the introduction, in 1875, of the Anson & Deeley boxlock cocking arrangement, hammerguns began to lose favor. By the 1880s the modern form of the double gun had emerged, and J.P. Clabrough understood that he needed a sidelock-based action. In 1881 J.T & J. Rogers were granted British Patent No. 397 for a hammerless, detachable, barrel-actuated back-action lock. (The Rogers Brothers were Brits who described themselves as “gunmakers,” although Crudgington and Baker described them as “action filers” in The British Shotgun, Volume Two.) On May 9, 1882, they were granted US Patent No. 257764 for the same design and assigned it to Clabrough. It was this design that Clabrough employed to compete against his major rivals in the US: British makers C.G. Bonehill, W&C Scott, and Greener. Not until later in the decade would US gunmakers make their presence felt in the hammerless market. It’s been said that the two greatest threats to guns are rust and politicians. And so it was for Clabroughs. In 1890 Congress passed and President Harrison signed what became known as the McKinley Tariff, a tax on imported goods. (Before he became President, William McKinley had been a principal advocate for the tax while serving in the House of Representatives from Ohio.) The Tariff Act of 1890, meant to protect certain domestic industries from foreign competition, hit Clabrough with a per-gun fee of $1.50 to $6 (depending on the declared value) plus a 35-percent tax. With a factory in Birmingham, it’s likely that Clabrough did some business in England, but his principal market was in the US, and these new fees were a devastating blow to sales. At 57, Clabrough was still relatively young, and he had invested well in real estate in the San Francisco area. In 1892 he sold the Birmingham gunmaking factory to a man named Douglas V. Johnstone. The following year he moved back to San Francisco and busied himself with real estate and the Clabrough, Golcher & Co. store, in which he still had a half-interest. In the summer of 1895 he was diagnosed with liver cancer; he died October 5. His estate was valued at $200,000—many millions of dollars today. Douglas Johnstone owned a small gun factory in Birmingham when, with some financial help from his father, he bought Clabrough. Johnstone changed the business name to J.P. Clabrough & Johnstone, but he sold guns under at least three names: J.P. Clabrough & Bros., Clabrough & Johnstone, and D.V. Johnstone. From his advertising, we know that his guns were marketed in Spain, France, Australia, Russia, Germany and the Persian Gulf. Johnstone also saw a new opportunity in North America: Canada, where he made a deal with the Hudson Bay Company. The HBC had begun in 1670 as a string of fur-trading posts, but by the end of the 19th Century, changing fashions had reduced the appeal of fur and the company morphed into a chain of retail stores and other commercial pursuits. Johnstone and the next owner of Clabrough built guns for the HBC until at least 1925. In 1914 Clabrough & Johnstone joined the amalgamated firm of Hollis, Bentley & Playfair. Johnstone headed the new organization, and a man named John Redgrave managed the business. The new group decided to produce military arms for the First World War and formed the Standard Small Arms Company. Within a few years they turned over the company to the British government, which christened it the National Rifle Factory No. 2 and made Johnstone its superintendent. Johnstone then sold Clabrough & Johnstone to Redgrave. In 1922 Johnstone joined Webley & Scott as its Managing Director, a position he held for 12 years. 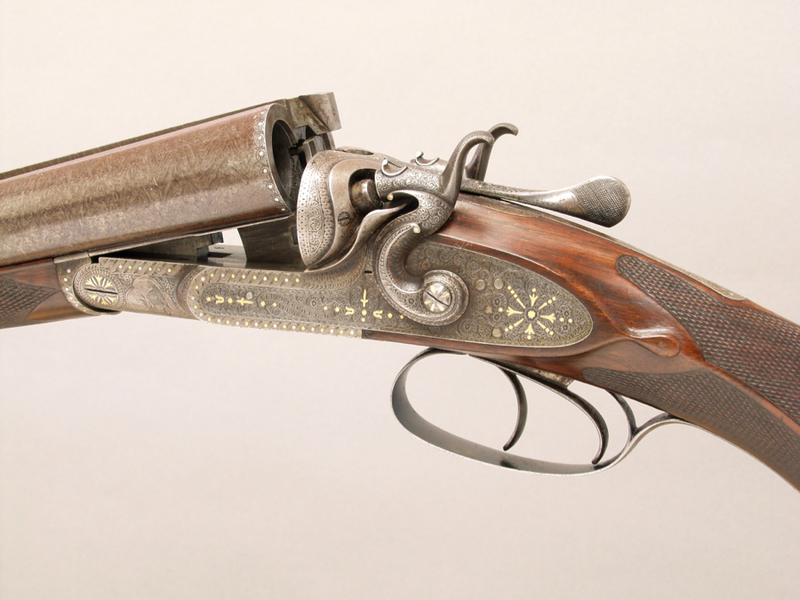 Like his predecessor, Johnstone was capable of making excellent firearms. In his book American & British 410 Shotguns, Ron Gabriel shares a bit of trivia that likely has set some London “best” purists to pulling out their hair: In 1916, when James Woodward & Son received an order for a .410 shotgun, it was built for the firm by Clabrough & Johnstone. 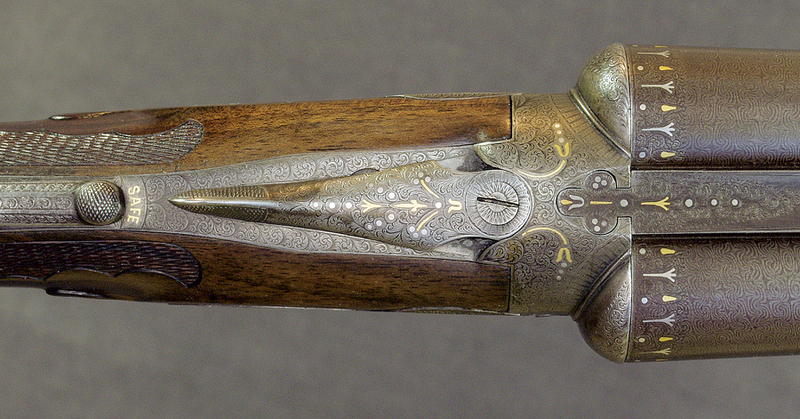 The Clabrough & Johnstone name was listed in Birmingham business directories at various addresses until 1946, but little is known about the guns Redgrave produced after the Great War. Like many other makers of that period, he—and his guns—just faded away. Best estimates suggest that approximately 80,000 Clabrough-marked firearms were produced. 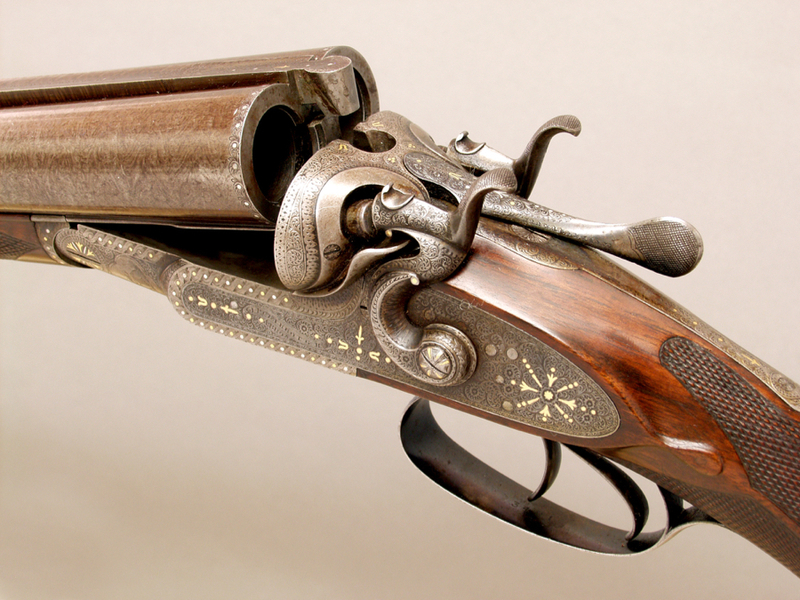 Many aspects of the Clabrough story are not unlike those of other Birmingham gunmakers. The company prospered during what has become known as the “Golden Age,” only to be overwhelmed by world events. Few realize that when Clabrough was sold to Johnstone in 1892, the firm’s highest-quality guns sold for up to $400—a price comparable to the best from Parker and other top-level American competitors at the time. Clabrough’s story is unique, because it began in San Francisco and migrated to England. Moreover, Clabrough guns from Bull Dogs to pigeon guns are woven into the early history of the United States—and especially California. 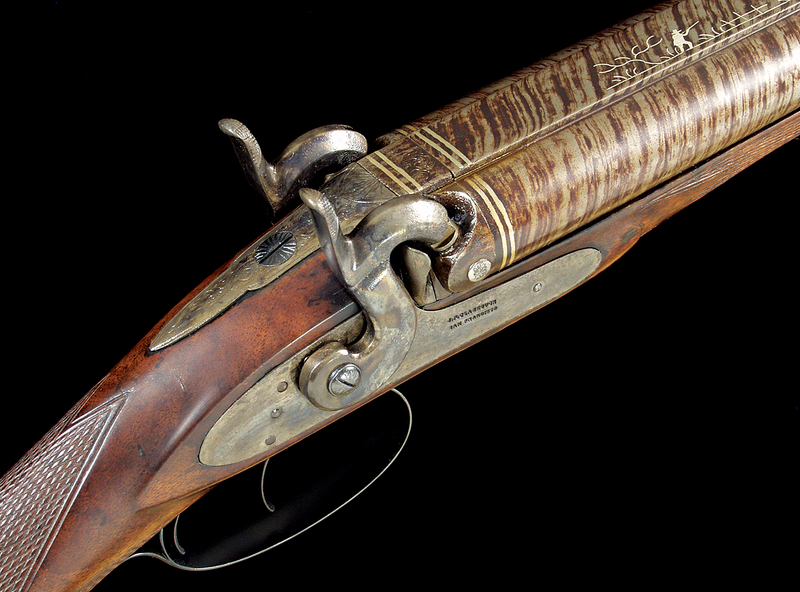 No other gunmaker can claim such a diverse and colorful history. Authors’ Note: Both authors have owned Clabrough guns and relied heavily on information in Larry Shelton’s book J.P. Clabrough—Birmingham Gunmaker (see review, p. 21). The book is available from the author for $85 (plus tax and shipping) by contacting Larry Shelton at lshelton [email protected]; www.clabrough.com. Steve Helsley, a retired California law-enforcement executive, is currently a consultant to the NRA. 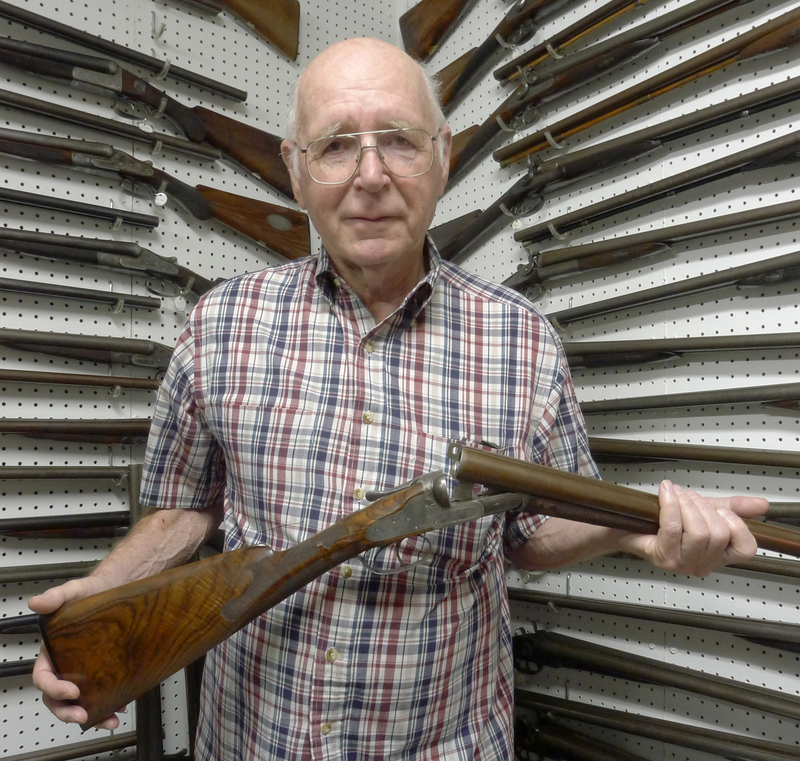 He is also a collector of vintage British firearms and an avid reloader. 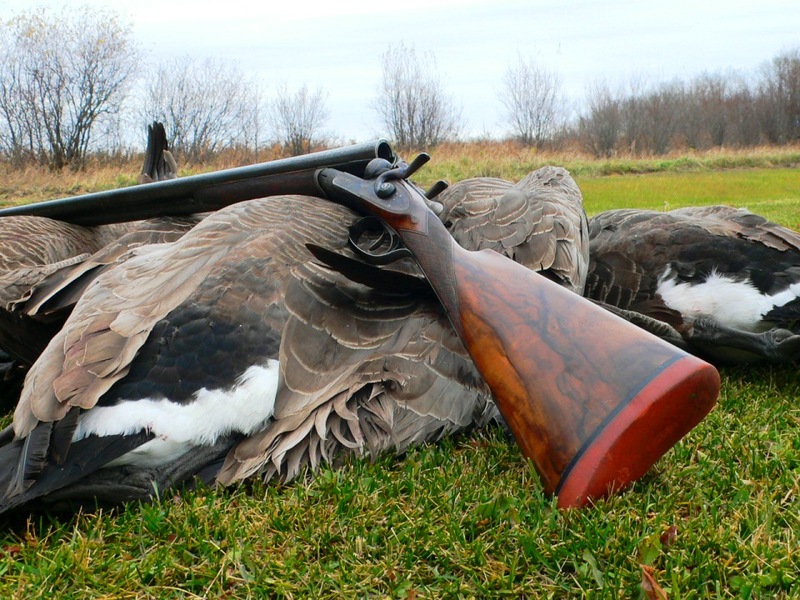 Roger Sanger is a devoted bird hunter and collector of vintage firearms. He is the founder and past president of the California Side by Side Society. If you’ve been a regular at major Western gun shows during the past 40-plus years, you probably have seen—and perhaps met and done business with—Larry Shelton. Shelton is a regular exhibitor, and scattered across his three or more tables are typically all manner of antique firearms, books, pocket watches, knives and other collectable goodies. Always at his side is his wife, Sandy, who probably has attended more such shows than any other spouse on Earth. 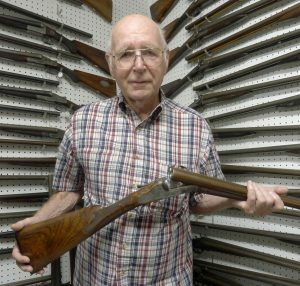 Aside from Sandy, Shelton’s first love is the guns of J.P. Clabrough—though not far behind are vintage California-made guns, Bowie knives and walking sticks. He suffers from advanced “Collectophilia Syndrome” but, together with an inquisitive mind, this has made him an encyclopedia of firearms knowledge. Shelton was raised in Stockton, California. His father was an avid hunter and a Colt and Winchester collector. (Larry learned well and, in turn, passed those passions to his own son, Rob, who now collects W&C Scott guns.) Larry fondly remembers that the gun-collecting hook was set when, as a teenager, he accompanied his dad to close a deal for a Colt revolver. During the negotiations, he spotted a Kentucky rifle that he realized he had to own, and he found a way to finagle the necessary $60. More Kentucky rifles followed. Meanwhile, he was reading everything available about guns and collecting. Then in 1970 he came across a magazine article on California guns by James Servin. Shelton wanted more information on an obscure San Francisco maker: J.P. Clabrough. Soon he realized that he’d have to do the research himself. 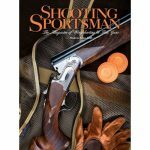 The result is his book J.P. Clabrough: Birmingham Gunmaker, 20 years in the writing. Is Shelton still collecting Clabroughs? Oh, yes. His advice to fellow buyers is to look for overall quality and details such as drop points and extra engraving. Assuming the machinery is solid, a mid-grade Clabrough hammergun or boxlock should command about $1,000. And in the event you locate a high-grade 20-gauge, don’t buy it—contact Shelton. —S.H. i have a 12g hammer double barrel Clabrough & Johnstone as as wall hanger missing firing pins , can you help me with a bit of history on it, nicely engraved only number i can find on oi is 1589 , thanks for any help you can supply . Cheers Peter. Bros – London Laminated Steel 10-Ga. shotgun. It carries a serial number of 15723.